Nine-year-old Caroline is spending the summer with her grandmother who lives along the bay. Every night she anxiously hopes for a jubilee which causes fish, crabs, and shrimp to mysteriously languish at the shoreline. She learns from the locals in Fairhope, Alabama that the Jubilee means different things to different people. One night, Caroline finally hears the dinner bells along the bay signaling a jubilee has begun. Will it be all that she has hoped for? June 22, 2010 in Fairhope, Alabama. It had been a long process and several years after the idea of writing a children’s book about a jubilee first came to me, it was finally becoming real. My publisher graciously allowed me to have a say in who would illustrate the book (something that is rarely done) After more than a year spent considering and eliminating suggested illustrators, we were finally able to agree on Julie Dupre Buckner, an artist from Plaquemine, Louisiana. Although Julie had illustrated other children’s books, it was her portrait work that made this an easy decision. I could see my characters in the style and colors she used in her portraits. I knew it was the right decision when the publisher began forwarding emails in which Julie asked specific questions such as, “How does Karyn see [a specific character]?” and “Do you have a Kodak camera like the one in the story for me to see?” The publisher had made it clear that authors and illustrators do not communicate directly with one another but after a dozen or so emails were passed back and forth, the publisher encouraged us to contact each other personally! I invited Julie to visit Fairhope saying, “How can you illustrate this unique place if you have never seen it?” Arrangements were made and Julie and I finally met on the Mobile Causeway one very warm June afternoon. We drove the route of the main character, Caroline, and I pointed out landmarks and shared local history as it pertained to the story. We shared ideas about the story and how to represent the people and places through the illustrations. Finally, we visited the Fairhope Library where Julie pulled out a copy of the text along with pencil and paper. She began to sketch and the characters that I had come to know and love appeared right before my eyes. “What can be better than this?” I thought. Little did I know what was in store for the rest of the visit. It was the middle of the night and I didn’t even hear the phone ring. Half asleep, my husband Jeff put the phone in my hand. “Hello?” I said in reaction to holding the receiver. I don’t recall what the person on the other end said, only that I went into an automatic polite response, “No, but thank you very much for calling,” and hung up the phone. A few seconds later, I jolted straight up in bed. “That was Julie and she said there is a jubilee!” I jumped up, threw on shorts and a t-shirt, stepped into flip flops, grabbed my camera and was on my way in a matter of minutes. I met Julie at the bayhouse where she was a guest. We could barely talk for laughing in disbelief. We headed down to the bay where I met Torie and Jubo dressed in pajamas and thrilled that a jubilee had actually occurred on the night of Julie’s visit. We were joined by a friend of the family who, fortunately for us, was experienced at jubilees. We grabbed nets, gigs, and flounder lights and just like the characters in my story, relished in the experience of the jubilee. Throughout the night, we gathered the delicacies, laughed, talked, and shook our heads in amazement over our good fortune. At dawn big drops of rain began to fall stirring up the bay and the remaining sea life scampered away from the shoreline. 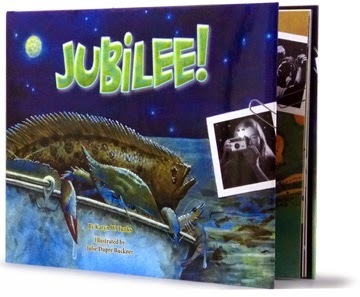 Even though the book had been through numerous revisions by that time, there were a few more to make based on our jubilee experience, such as gigging flounder two at a time and the eels squirming underneath the feet of the jubilee hunters. Although I had done considerable research, there just was nothing like actually experiencing this miracle firsthand. The portrait artist in me was excited about depicting people in this new book "Jubilee!". It was a big departure from the Clovis Crawfish series I had illustrated. This meant a road trip to gather information and photographs of Fairhope, Alabama and meet the author Karyn W. Tunks. I had planned to book a hotel, but serendipity intervened by way of a friend. Jubo just happened to be going to Fairhope from Baton Rouge on the same day, and arranged for me to stay at her friend's home on the bay. I had never met this friend of a friend, but decided to check it out. 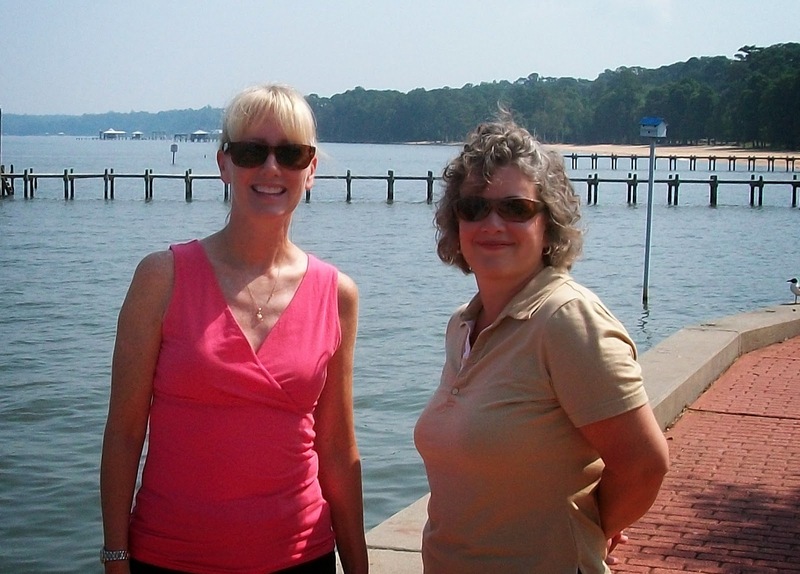 I arrived in Fairhope on Monday, June 21, and met Karyn on the on the causeway just east of Mobile. We introduced ourselves and began our excursion through the Bankhead Tunnel to Fairhope, around town, and then to the bay. I was taking photos all along the way. She pointed out prominent places, including Fairhope Pharmacy where we stopped in for a visit. We explained our book project and a long time employee brought out a book from behind the counter with 1960's era photos of the pharmacy. I was able to get a copy as reference for the book. Karyn showed me more landmarks as we visited Page & Palette, various shops, the K-1 School, and the Fairhope Library, where we sat down and discussed imagery for the book. Next we headed down to the bay. I was surprised at how different it was from the gulf shore we knew so well. The land dropped off in tan bluffs to a bay as smooth as glass. After Karyn and I said our goodbyes, I drove to Torie’s bayside home. She had graciously opened her home to me, a complete stranger. As Jubo, Torie and I talked about the book, Torie related how she had experienced about thirty jubilees and what great childhood memories they were. I was fascinated to learn sometimes a jubilee was of flounder only, or just crabs, or shrimp; and sometimes a combination of these. The three of us walked out on the wharf at sunset and Torie noticed the water had an unusual golden cast. I saw what looked like foam cups floating in the water. Upon closer inspection, those white "cups" were confused crabs who that were belly-up and trying to swim, but going nowhere. Torie said, "It looks like there might be a jubilee tonight." Jubo and I had retired for the evening. Torie did, too, but she was restless and continued to walk down the wharf every hour to see if anything was developing. I felt satisfied with all the information from Karyn, Torie and Jubo, plus the photographs I had, that I could illustrate the book fairly accurately. Exhausted, I fell asleep quickly. The next thing I knew, someone was shaking my arm. What? It's two a.m. Jubo was trying to wake me up. She was shouting, "The jubilee! There's a jubilee! Right now! Hurry! Call Karyn now!" I threw on some clothes, grabbed the camera and the cell phone. Karyn's husband answered the phone and I apologized for calling so late, but that there is a jubilee happening, and could she come down to Darling's Landing fast. Karyn grabbed her camera, too, and met me at the gate. We simply couldn't believe it. It was about three a.m. now, and there we were with borrowed dip nets and wash tubs, blinking the sleep out of our eyes. lit up by our flashlights. Some of them were too large to fit in my home oven, so I went for the mid-sized ones. They were so heavy, the large dip net was bent to almost breaking. Karyn was grabbing crabs with bare hands and we were adding them to the washtub, covered by a towel to prevent escapes. Other people began to show up along the bay. I caught glimpses of rubber boots, tennis shoes, flip flops, pajamas, flashlights, gloves, gigging poles, nets, wash tubs, and laundry baskets. The flounder were more numerous than before and I could now scoop two at once. I realized it is possible to catch too many to eat, so I stopped and just enjoyed the scene. It was pitch black outside except for the flashlights and a few stars. I knew I would have to illustrate this in a purple-blue tone so as to show all the activity. Around five a.m. it began to rain. Re-oxygenated water was needed for the marine life to make their escape, and they quickly disappeared. I stayed up to greet the sun and a friend of Torie's showed me how to scale and dress flounder, though he did most of the work. After the catch was iced down, Jubo and I pan fried some fresh flounder for lunch and went back to sleep. It was nothing short of a miracle to experience a jubilee. Had I not called Jubo , I would have missed it. Had I stayed in a hotel as planned, I would have missed it. Had I come on any other day of 2010, I would have missed it. If Torie hadn't stayed up all night, I would have missed it. And if I had missed it, Karyn would have, too. 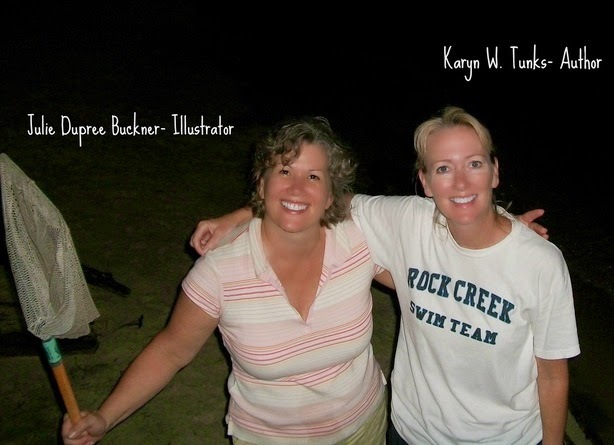 We are both extremely fortunate and the experience has been invaluable in illustrating Karyn's book, "Jubilee!" 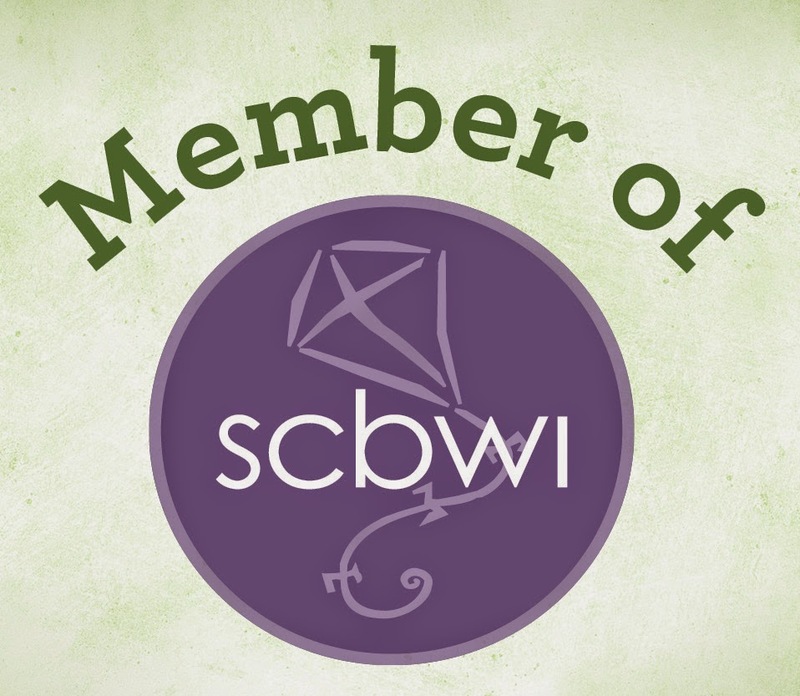 I am Karyn Tunks, a fanatic reader, writer, collector, reviewer, and teacher of Children's Literature. 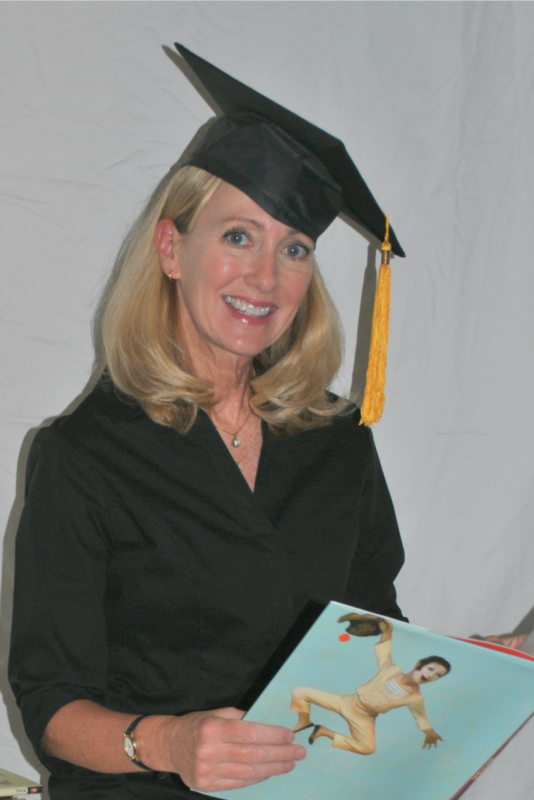 I have over 25 years of experience teaching all ages from preschool to graduate students. My blog is designed to share a love of children's literature and to encourage readers...one story at a time.